i love rock or pop music. 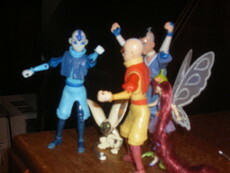 and i do not like to wait till the avatar: the last airbender to come back on, even if i have to wait for friday. i love to meditate, and i love to draw avatar art, and teen titans, and power puff girls, my life as a teenaged robot and i like to imagin i'm flying, and i like the cold weather, when it's cold outside. and i like to learn how to do new tricks, LIKE flips, and i train myself how to do stuff. (did you know im a chatter box?) i like fan fictions from on nick.com, i really like a fan fiction i read every day that is called the mysterious girl. (the fan fiction is on avatar - fan fiction...idk if that fan fiction was deleted yet though) i'm 11 years old. thanks, for the commets, on this profile. YAY I GOT A CAMERA! WOOT!...ahem...well,....3 or 2 year i got one, lol...how else, did i get these pictures, on here?! lol...Next month im turning eleven! ^_^. The white man said, "Colored people are not allowed here." The black man turned around and stood up. He then said: "Listen sir....when I was born I was BLACK, When I grew up I was BLACK, When I'm sick I'm BLACK, When I go in the sun I'm BLACK, When I'm cold I'm BLACK, When I die I'll be BLACK.But you sir, When you're born you're PINK, When you grow up you're WHITE, When you're sick, you're GREEN, When you go in the sun you turn RED, When you're cold you turn BLUE, And when you die you turn PURPLE. And you have the nerve to call me colored?" The black man then sat back down and the white man walked away.... Post this on you're profile if you hate racism. A recent quick 15 minute story I did... It's about two monthes old. Naraku sends the Inu-gumi(GUMI!) into Barney's world! Will they survive? NOT RECOMONDED FOR KIKYO LOVERS! Okay. One day I was bored so I made up an Avatar OC. Her name is Amber (oooh.... creative) and she's a firebending EarthNation rebel. Read. It's interesting. After the seige of Ba Seng Se, Zuko is faced with many tormenting feelings, including a not-so-clear conscience. As he sets out of the large capitol for a break away from the chaos, he finds more than just a bit of fresh air. Once again, Kagome is hurt by InuYasha's Love for Kikyo...But this time, she takes it to the extreme. Summery inside, trust me this story is pretty good. Anyway, its a story about a group of fantasy creatures(most of them are at least) that are given the task of saving their country of Fentil.